Next up on the “designs published last year” list: a pair of colorwork house socks designed for Clara Parkes’ third book The Knitters Book of Socks. 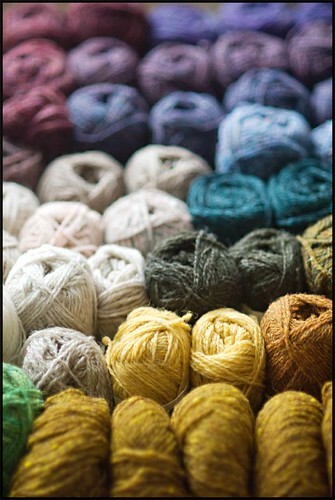 If you’re not familiar with Clara’s books, I strongly recommend all of them, particularly if you are interested in learning about wool properties or yarn construction. As many of you know, I’m not much of a sock knitter – I’ve never been seized by the fever, though I do find them entertaining to knit every once in a while. This was my first go at actually designing a pair and I had a great time doing it. 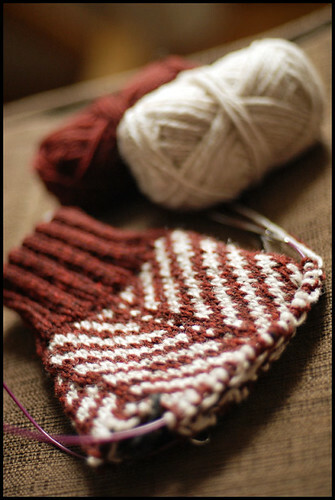 You may recognize the motif & color combination as a companion design to the Strago Mittens (Fall 2010). Sometimes when I get an idea in my head, just one design isn’t enough and I like to continue exploring further applications. In this case I thought the graphic patterning of the mittens would suit a pair of warm, stranded socks perfectly (herringbone hound that I am). I remember now – this was the first design commission I did when developing Shelter. The two colors – Fossil and Long Johns – were, at the time, the only two colors from the palette that I had on hand at my studio (these were the very first two colors the mill produced). I took this as a sign that a companion sock to the mittens should happen. Shelter is by no means a sock yarn – and it doesn’t claim to be – though I’ve knit a couple of pairs that I wear in the winter to keep my feet warm around the house, and it does the job wonderfully. I think of them more like slippers than socks. The double-thick fabric of colorwork makes these particular socks more durable than a plain stockinette pair, and that much warmer. As for the rest of the book – it’s packed with great sock patterns! Some of them were enough to get me considering trying a pair or two…though I’m wary of going down the sock yarn rabbit hole to do so! Many knitters have never returned. I hope you enjoy these, along with the rest of Clara’s informative, well-written homage to knitting for our feet. There was a lot of interest in the textured throw from my last post, so today I’m here with more details! I ended up having a bit of extra time over the holiday to work up a pattern for it, which is now available. In a classic color, I think it makes a great addition to any living room, although in my case it’s been acting as extra bedding during this wonderfully cold weather we are having. 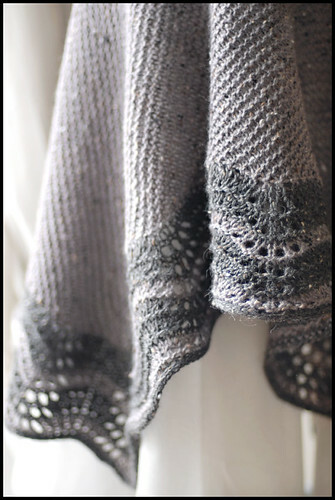 Umaro combines a little bit of everything — cables, lace, and knit-purl patterns — to create a veritable symphony of texture. 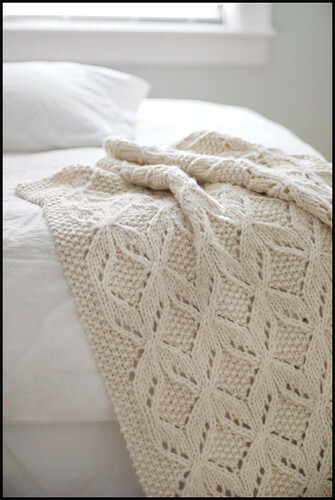 The throw is made using super-bulky yarn, which helps amp up the stitch architecture nicely. 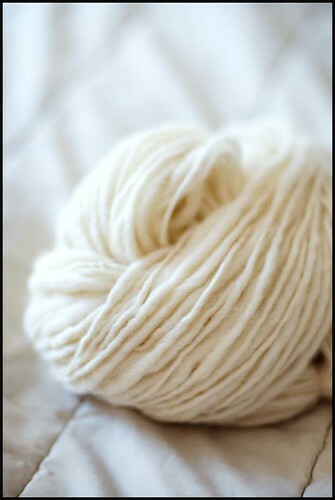 I recommend a nice round yarn that has great stitch-definition for best results. 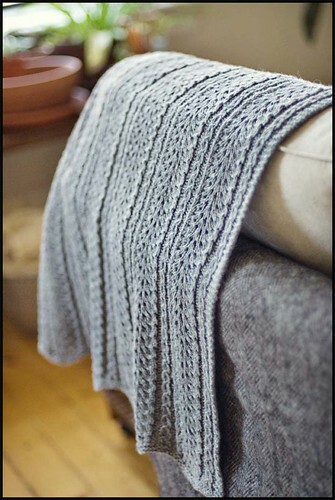 I knit mine with Cascade Lana Grande on size 15 needles — talk about instant gratification! 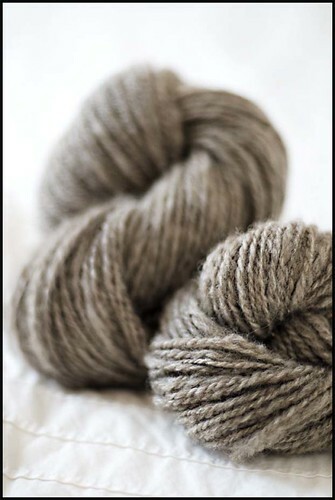 Lana Grande is a super bulky 3-ply wool with a very round shape as a result of its plying structure. I think it was a good fit for the textured fabric. 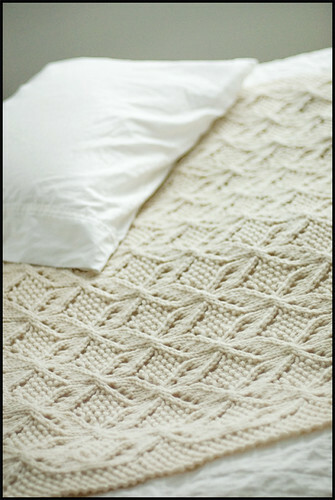 The pattern is written for finished measurements of approximately 48″ x 57″ after blocking — a nice size for a generous one-person throw, or even a top blanket for a full or queen-size bed. Instructions are included in the pattern for simple adjustments to make a larger size, as needed. A conscientious blocking job is the key to making this throw look its best. (I sound like a broken record with all my blocking talk month-in and month-out, but it really is the Knitter’s ace-in-the-hole!) Because of its large size, wet-blocking is not completely reasonable (although it is possible for the adventurous among you!) — I took this beast down with a good steamer and a lot of T-Pins. Beginning with a gentle steam over the entire piece to relax it, I then pinned it out so that the fabric was slightly stretched and laid flat. When using pins on straight edges you have to take care to keep your edges very clean and orderly so as not to create unwanted scallops or points in the finished piece. In general I use blocking wires for this type of job, but with such a heavy yarn and light blocking wires it wasn’t a good match, so the T-Pin route was adopted! After pinning, you’ll want to give the fabric a very slow and generous steam to get moisture into all parts. After this is complete, let the blanket air dry before unpinning. 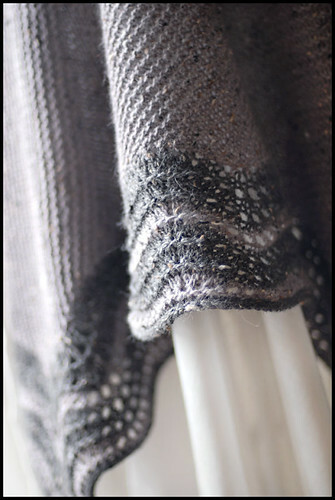 The blocked fabric will have better movement, drape and overall behavior than its previously unblocked self. 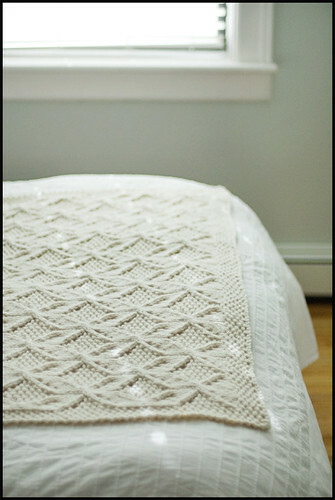 The pattern is available now as a PDF download at Brooklyn Tweed or via Ravelry. Enjoy! The next pattern up on the docket took a dose of inspiration from a recent experience I had with a vintage family heirloom. When I was home visiting my mother last summer she revealed a family treasure that I had never seen before: her very own lace baby shawl. A stunning yet simple piece of lace that had been lovingly knitted for her by my great aunt in a dusty pink Shetland-like wool. The shawl featured a delicate Old Shale lace motif and had been carefully preserved. Weeks later I hadn’t been able to shake the image of it from my mind and soon found myself binging on Internet images of similar styles before deciding to do up a version of my own. 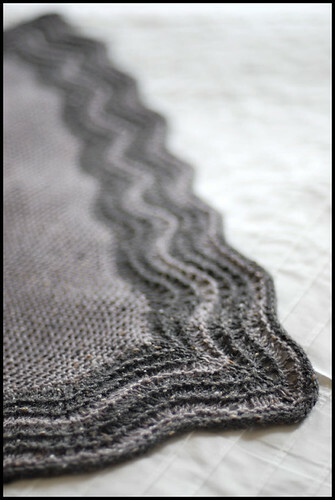 While most of the images of vintage baby shawls that I encountered featured Old Shale lace patterns on a stockinette ground, I wanted to play with a bit more texture and depth. The stitch pattern featured here is an obvious cousin to all of those beautiful Feather-and-Fan motifs we know and love, but with slightly more dimension. Worked over a purl background, the feather columns take on a relief-like quality due to the use of Knit-4-togethers and Slip-Slip-Slip-Slip-Knits (yes, they do exist!). 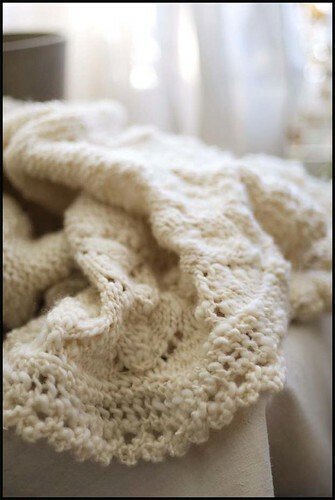 These hungry decreases cause the feathers of lace to “ridge-up” as they span the length of the blanket while being separated by pretty eyelet columns. Simple and sweet. The finished dimensions measure approximately 32 x 40 inches. 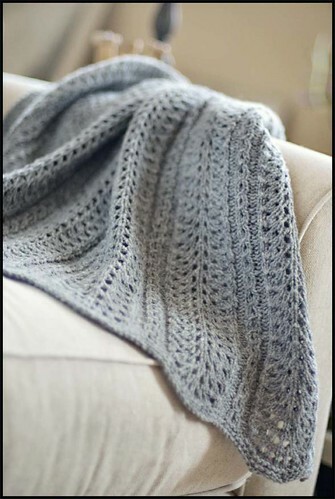 The pattern, however, is easily modified to add or subtract width or height in case you’d like a different proportion, or have less/more yarn. Shown here in Sweatshirt (one of my personal favorites from the Shelter palette), I think it creates a comforting addition to the nursery. 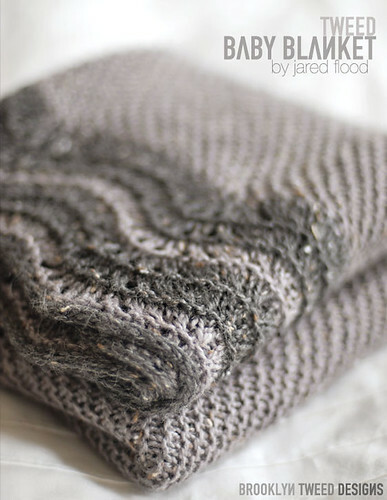 The pattern is available now as a downloadable PDF through both Brooklyn Tweed and Ravelry. I hope you enjoy it! 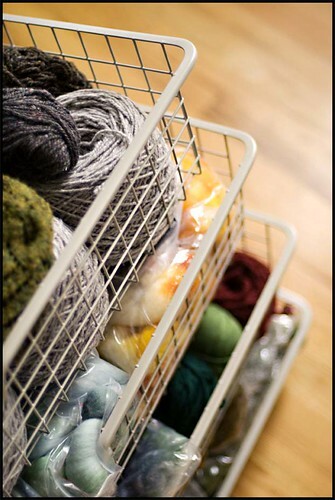 The organization of yarn inevitably meant the organization of projects (major bonus), which meant that I’ve been stricken by that wonderful feeling of falling-in-love-all-over-again (or what I like to call Knitter’s Christmas). When a project that we once fell out-of-love with comes rushing back into our lives and we see it with fresh eyes as we once did. One previously stalled project of mine gave me the familiar rush and has been welcomed back onto the regular roster of nightly knitting with open arms. 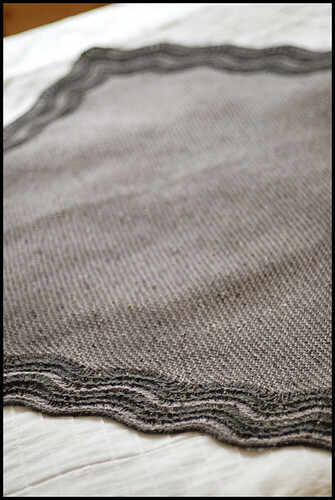 My thick-and-thin handspun corriedale lace blanket dates back to circa Spring of 2008, as best as I can tell, and is just the type of project I’ve been craving lately. It’s already large enough that I can use it as a lap blanket as I work. I consider this a major plus. I originally put this project aside because I ran out of yarn and didn’t feel up to spinning more right away… which in turn meant that this fluffy cloud of handspun got inadvertantly buried and has been lying dormant ever since. The construction is almost identical to the Bridgewater Shawlfrom Made in Brooklyn, and in fact when I was starting work on the book I still had this piece knocking around in my head. Aside from the obvious difference in materials and a simpler knitted-on edging, there is virtually no difference between how the two pieces are constructed. Which is yet another example of my favorite part about lace — the same piece can be completely different with decidedly different materials. Each more delicious than the other! 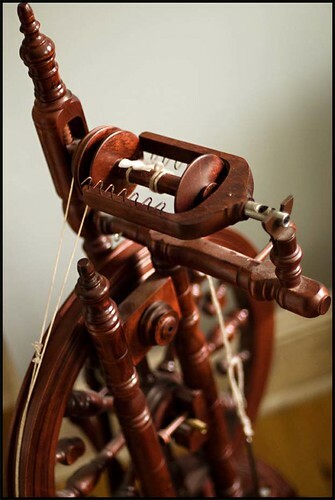 So, yes — I’ve fallen for it again, which leads me to my next admission: I’ve been having a love session with my Spinning wheel this week. I went back to spin up the remaining Corriedale fiber so I could finish my blanket… but when the yarn came off the wheel and was ready to knit, I didn’t feel like stopping. So I consulted my humble fiber stash and just kept spinning. 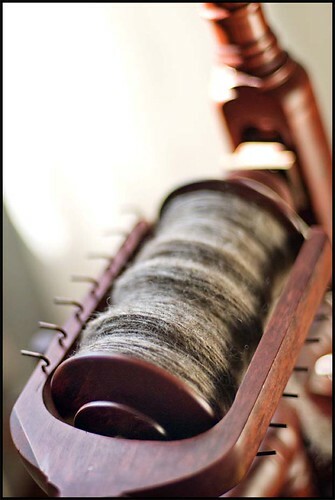 And I’ve been spinning all week! It feels fresh and relaxing and is the perfect activity for sitting next to the window and enjoying the wonderful sunlight (after endless days of monsoon rain) that reminds me Spring is almost here. I’ve spun up about 300 yards of dk-weight 2-ply, lightly plied and can barely wait for it to dry so I can get it on my needles and start making fabric. In a few days I’ll be leaving for a … wait for it… VACATION (I can hardly believe it myself) and I think this handspun will be my treat for mindless vacation knitting. 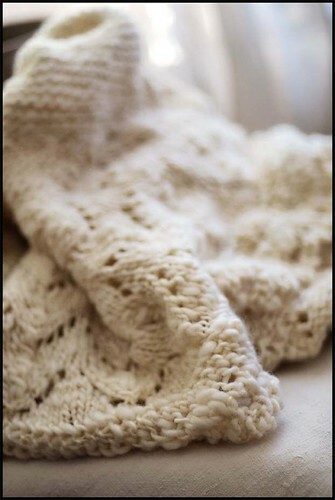 As for the lace blanket — I’m closing in on her. I have a little less than half the edging to finish, although I’m worried I might run out of yarn (again) just before the end. But you know what? I’m happy to spin more right now… just in case. After days and days of honest (and sometimes tortured) sorting, I feel like I’ve been through a gauntlet and come out on the other side amazed at what was lurking in the depths. When you commit to giving your stash a deep-cleaning you expect to feel organized afterwards… but what I wasn’t expecting was how inspired my own stash has made me. Assessing the whole scope of it caused me to start making connections between yarns that have probably never even been in the same room with one another. 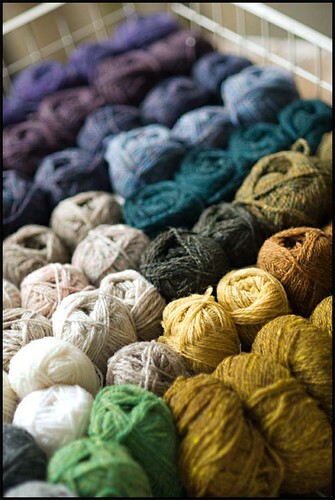 Aside from being organized, I’m now living amongst a beautiful palette of wools that has my head spinning with ideas. I was lucky enough to be able to find grateful hands for all the yarns that were jettisoned, which is probably the reason for the sense of lightness that I now feel, and ended up donating a small amount of yarn to a local charity. 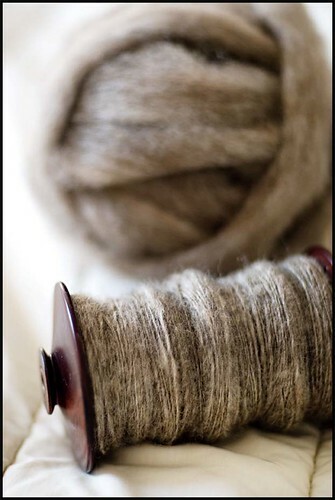 All that remains are yarns that I’m absolutely itching to work with – oh what a feeling! The crown jewel of them all: I rounded up all my Shetland yarns and put them together in color groups (shown above) — what a thing of beauty! I couldn’t resist taking photo after photo of these amazing colors all lined up together. A kid in a candy store comes to mind. Is there anything more humbling, dare I say embarrassing, at least for a knitter than coming face to face with the whole of your Knitting Materials? 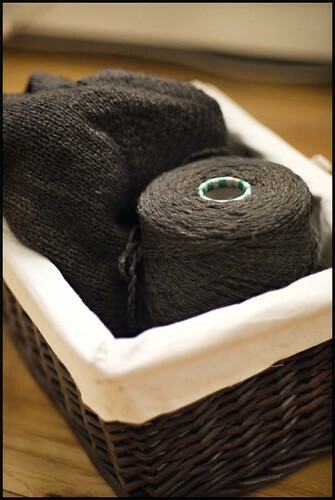 This would include Stash (all of it), unfinished projects (old, new, and reaaaally old), & Tools both large and small (everything from swifts and winders to all 18 of your floating tapestry needles). Well this is what happens when knitters move. And generally the amount of years you’ve lived in your own Knitting Paradise exponentially increases the scope of just how many loads you’ll be making out to that van. Aside from about 13 days of travel, my life has been eaten by a stressful urban move. And while I absolutely love the architecture of Brooklyn brownstones, and wouldn’t trade them for anything, Moving Day is probably the only time I find myself truly cursing the day I ever heard the term “3rd flood walk-up”. And when you move from one “3rd floor walk-up” to another, by my math, it’s more like a “6th floor walk-up”. Multiply that by every box of yarn you own (knitting books too) and you might find yourself wistful and dreamy for even the smallest of elevators. Of course it’s not all drama, especially in hindsight. I’m in a place with great light and more space (for all that yarn) and while it’s easy to complain, I really do appreciate a good purge every few years. 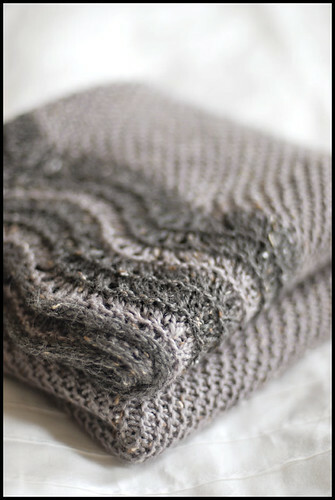 Which brings me to today’s post about being honest about what we have, and more importantly what we, as knitters, need. 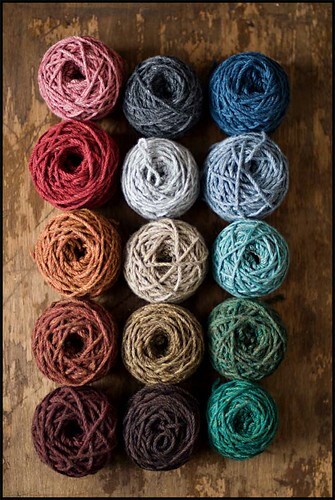 It makes sense that our knitting palettes become more refined as our craftsmanship does. That happens in any artistic discipline. And in studying what I’ve held onto over the years, I began doing what I do whenever I’m faced with an overabundance of information — organizing and categorizing. In doing so, I’ve started to notice that my stash (which I used to brag as very modest… somehow I don’t feel comfortable with this description any longer) falling into three main groups. The first is the group that is most obvious and, I think, most important. Those are yarns that really excite me. Often recent acquisitions, or older, special acquisitions that still retain that spark that gets ideas running around like crazy in my head. These are the yarns that usually live on top of a given pile or drawer, or at least are never far enough away that I can’t have immediate access to them. These yarns have no surprises — I know I have them, I know I want them, and I know I’d make a fuss if someone took them away from me. These yarns have evolved with me and I believe are very valuable in terms of how I use my time as I continue to make projects with my collection of materials. The second group is actually the hardest for me to reconcile. 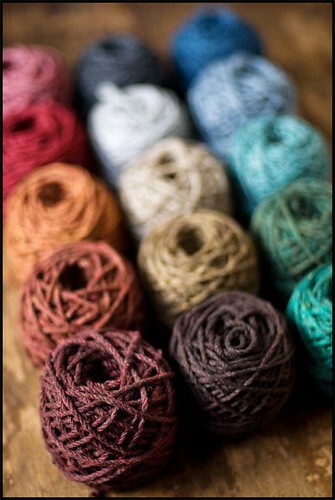 These are yarns that, at one time or another gave me The Spark, but have not retained it as I’ve grown as a knitter. These are yarns I definitely still like a lot, but I wouldn’t say I love, or couldn’t live without (if I’m really honest). These are the yarns I’d be grateful for if I ended up stranded in the arctic with nothing but yarn and time… but the yarns that,over the long run, will probably end up taking up the most room and take the longest time for me to give away because I *might* use them. When I finally do end up stranded in the Arctic and somehow my yarn is magically there with me, maybe I’ll kick myself for getting rid of much of this group, but until that happens, I probably will appreciate the extra space (both physical and headspace) they allow. The third group is easy — it’s the group that randomly finds its way in and sneaks around my generally thorough screening process (which, when you’re living small, is very very important). This includes all the yarn that has been given to me when people are cleaning their apartments and know that I’m a knitter, or yarns that were so reasonably priced that I couldn’t bear to see them go to waste, even though that’s kinda what they’re doing anyway. Now they’re just doing it in my closet. 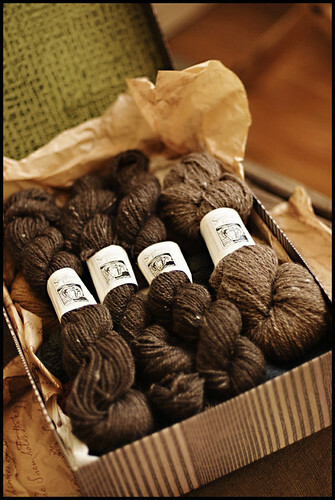 Or they could just be those few odd mystery “What-Was-I-Thinking” skeins. There are some of those too. All this to say that I’m being diligent and most of all honest with myself about what I need and what is surely overabundance. Too much yarn sitting un-knit starts making me feel nervous and greedy, especially if I think how much more beautiful this yarn is in the hands of someone who is enjoying every stitch. Among other things that were lurking in the shadows: baskets of unfinished projects, some of which I promptly frogged for salvaging yarn (Group 1), and others that genuinely got me excited again and have rematerialized alongside my current project baskets. And then there was my trusty (dusty) minstrel… just waiting to be used to turn all that excess fiber (did I mention, there is fiber too?) into more… yep, yarn. I’m committing to at least giving this all a good try and passing on some wonderful materials to appreciative fingers. And with the survivors of the purge? Well I think I’ll just get knitting with those. Is anyone else feeling the post-holiday-weekend-Monday blues? I escaped for a long weekend in the Catskills with friends – fireworks, bonfire, barbecue and knitting – lots of knitting! I thought about posting this pattern before the weekend and then thought it might be a fun pick-me-up for the aftermath. I hope it finds you feeling restored wherever you might be. 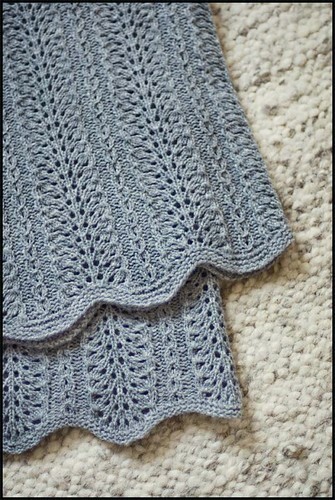 The pattern for the Tweed Baby Blanket (see my original post on this piece here) is now available for purchase in either my Ravelry Pattern Store or through PayPal. Notions: You’ll need 4 stitch markers – I recommend having one in an alternate color to be used to indicate the beg of round. Blocking wires or blocking pins – whatever suits your fancy for blocking lace-type pieces, and as always, a trusty, blunt tapestry needle. 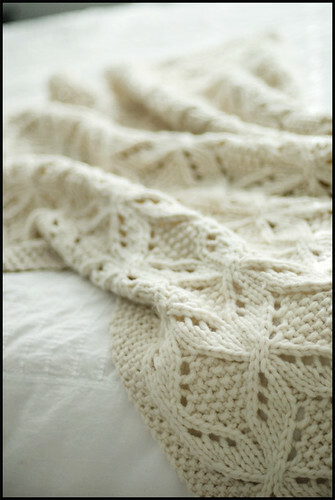 If you’re a Ravelry member and prefer acquiring this pattern there, click on the Ravelry button. If you aren’t on Ravelry or prefer PayPal directly, click on the PayPal button. I have plenty of knitting to show – it just needs to be photographed. I’m closing in on my merino/cashmere pullover and having fun with new yarns and Shetland lace. Oh my! Ooh this was a fun one! Back in February when I heard of my impending uncle-dom, I began working on a garter stitch square with the intention of turning it into a baby blanket/shawl for the little one. 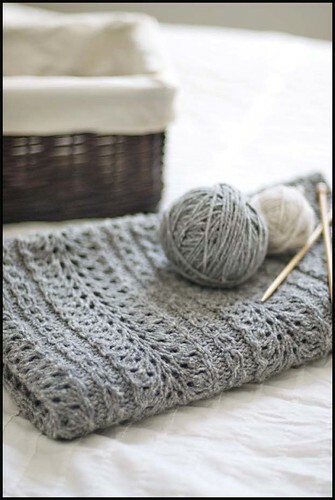 I never tire of a good garter stitch square trimmed with a lacy edge – I think they’re simple, elegant and wonderful to knit. They never do you wrong. Ever. At the same time the garter stitch knitting was happening (academic de-tox) I was amassing a stack of Shetland Knitting History Books (pleasure reading) on the bedside table. Being exposed to pages and pages of the most unbelievable Shetland lace, the beautiful Hap Shawls put a spell on me (I think I’ll make an ‘official’ one this year) and, when it came time for choosing a suitable edge to incorporate my second-color, Feather-and-Fan struck back with a vengeance! The nice folks over at KnitPicks sent me some of their new City Tweed yarn to play with. It’s super soft and allowed me to create a shawl that’s baby-skin-friendly while masquerading as something a bit more rustic (rustique?). I knit the (DK-weight) yarn up on an 8 and blocked the piece as for lace with blocking wires and a nice drumskin tension. 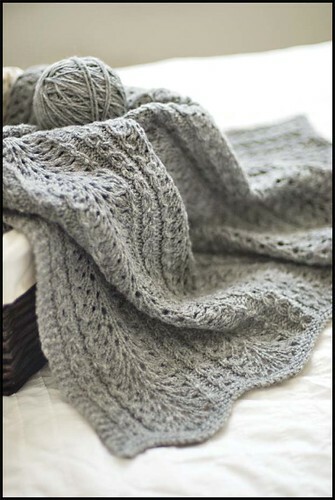 I love how it came out – the softness and squishiness remains but with a drapey, shawl-like quality. The garter stitch is worked on the bias, starting with one stitch and increasing one stitch on each row to create the square – at the halfway point, just replace a decrease for your increase and you end up shaping it back down to one stitch. Then it was just a matter of picking up stitches and Feather and Fanning myself into oblivion. I finished off with an applied I-Cord to keep simple, felxible edge and of course adhere to the ‘no-hard-bind-offs’ rule of lace blocking. It’s a bit early for October, but I guess it just means we’ll have more woolens to chat about between now and then. 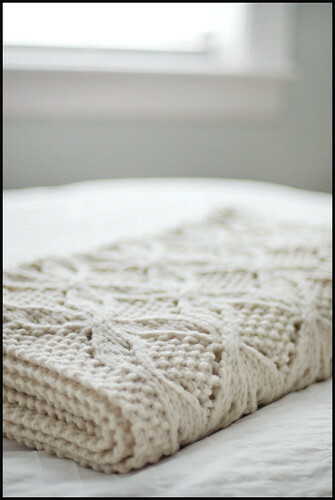 Is there anything better than knitting for a Fall arrival? 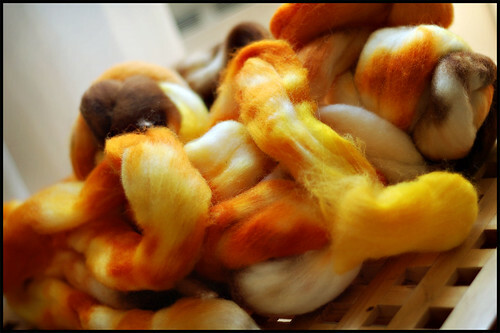 Oh, wow – spinning has snapped me up again! I never see it coming. I had been fiddling around with my Jamieson’s Shetland sampler and my mind began to wander. At some point I thought, “I wonder what else I have lying around here waiting to be spun?” It was probably a good thing I had my fiber hidden so well, cause it took me this long to rediscover some major gems. I came across this colorful fluff, which I had scooped up from Adrian late last Spring. It was like a blast of sunlight on a particularly grey day. I was weak. I caved. I hunkered down and did the first skein all in one sitting. Maybe I just blacked out and this is what happened? 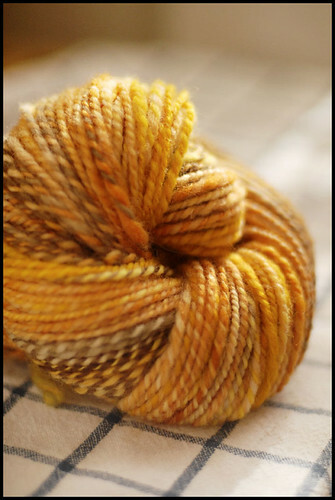 I’ve never thought about what yarn dipped in honey would look like… but that’s the first thing this skein made me think of. This is 4 ounces and I’ve got a good 8 more to spin. I’m a happy camper. 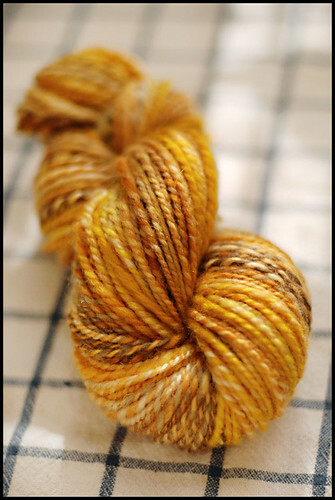 Aptly titled Hive – this is Falkland Wool from a past installment of the Hello Yarn Fiber Club. I spun it up using a semi-worsted method. 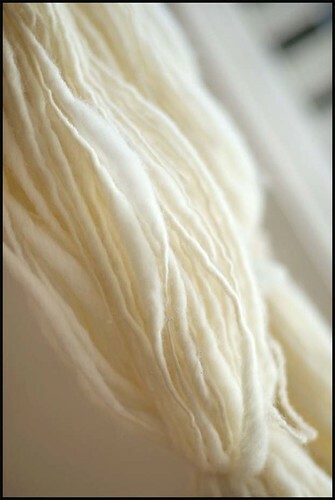 It’s a 2-ply heavy worsted weight. We had some nice quiet time together yesterday morning – and as I quietly sculpted the skein by the window for its photoshoot, I had one of those Yes-You-Look-Like-A-Crazy-Person moments. The colors! The textures! The Seduction! As for knitting – I was struck by a sudden desire to make a good, sturdy pair of mittens this week. My internal colorwork clock must have flatlined. I raided my Jamieson’s Shetland stash (I always keep at least a little Shetland close at hand. I sort of think that Jared-is-to-Shetland as bee-sting-allergies-are-to-the-EpiPen.) Do you ever feel that way about yarn? No? Just me? I’m sort of… eh, winging a pattern. I wanted something simple, geometric and sturdy. And a sheepy, heathered version of the traditional Red-on-White Fair Isle combo. Between these mittens and my wheel, I’m having a very reclusive week. Better beef up my take-out menus.